We sell a wide range of Obsolete bank notes, United States and Confederate States currency spanning the 1800s through the 1860s. Our items for sale are presented in PDF text lists with attribution, grade (traditional/EAC, third party, or both), and price. Selected items are pictured in the gallery. Since we have far more inventory than we can post pictures for, please contact us for pictures or scans for items not featured in the galleries. 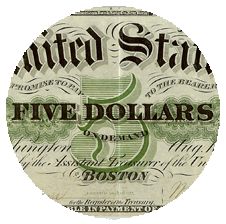 Obsolete currency (also known as bank notes or broken bank notes) was issued by banks during the antebellum and Civil War era from the 1780s through 1866 in the United States. 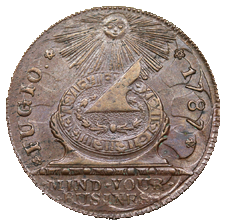 Presumably backed by gold, this currency was used locally to simplify commerce for transactions requiring gold coins. There were over 3,000 banks and related institutions that issued this money in more than 50,000 distinctive designs! 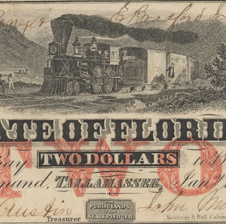 A fascinating area to collect, collectors usually focus on towns or state important to them or the vignettes on the notes like eagles or trains. Many obsolete bank notes may be purchased for less than $200 making this an affordable arena to collect. I use the traditional or collector grading described in Collecting Confederate Paper Money as well as third party grading with my modifying stickers indicating superior notes – plus, choice and gem for the grade. Confederate Treasury notes or currency was issued by the national government of the Confederate States of America from 1861 to 1865 in seven series. 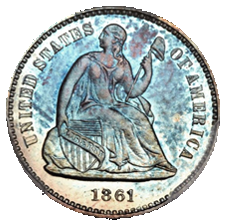 There are 70 regular issue types to collect, three popular fantasy notes, contemporary counterfeits made mostly in the Union, varieties of the types including major watermarks and errors, and military, civilian and place issued interest bearing 1861 and $100 1862 notes. We deal in all the above and have built collections in every area. Collections may range from around $1000 for a nine note set of 1864 or eight note set of 1863 to as high as you want to go collecting major rarities, varieties, military issues and other fascinating examples. 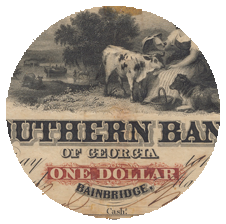 In addition to the well-known and popular Confederate Treasury notes, most of the southern states issued paper money as well. There were a few antebellum issues, notably the Republic of Texas notes. 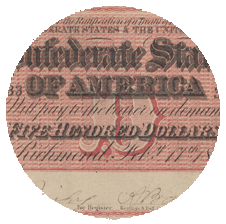 While the United States Constitution forbade the states from issuing money, the Confederate Constitution allowed it – hence these beautiful and affordable notes from numerous states. The United States did not issue paper money until the Civil War save for a few rare War of 1812 issues. Currently, we deal in Large Size Demand Notes of 1861 and Legal Tender of 1862-1869. These notes are graded by either PCGS or PMG with my modifying stickers indicating superior notes – plus, choice and gem for the grade.